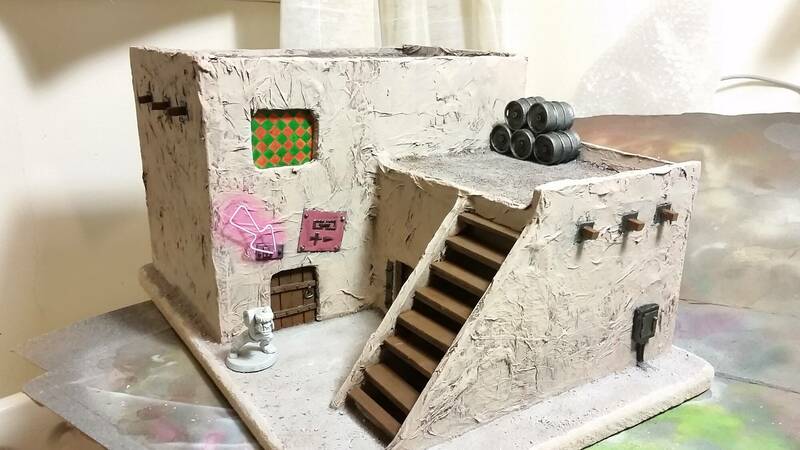 I love terrain. So very much. It’s something that jumped out at me reading Da Uvver Book back in ’98. There weren’t that many photos but the stuff on show just sparked my imagination like nothing else. They produced another book by the same name in 2003 that was substantially better but I was busy building PCs by then! My main complaint about the book, at least when it came to sci-fi stuff, was that the builds suffered from Blue Peter syndrome. Essentially it was too obvious what the source materials were for some parts. Ironically on the builds this applied to they also did an excellent job of disguising some of the other raw materials. The thing being that we’re great at object recognition (unlike, say, koalas…) and if something is too easy to spot it’s difficult to unsee. One of the ways to get around that is to simply add other details to draw the eyes. 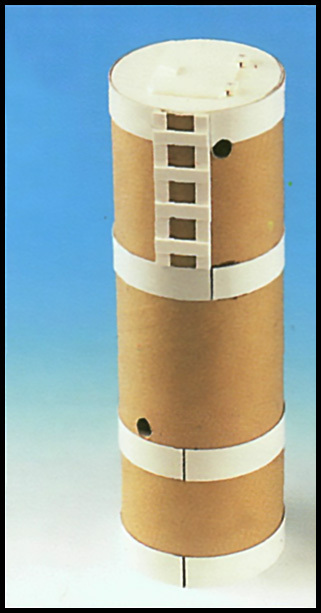 The tower in the back is just a kitchen roll but the extra strips around it and the hatch on top are enough for our brains to accept it as a tower. This is precisely the lesson I’ve taken to heart with my own builds. Give the piece things to draw the eye. 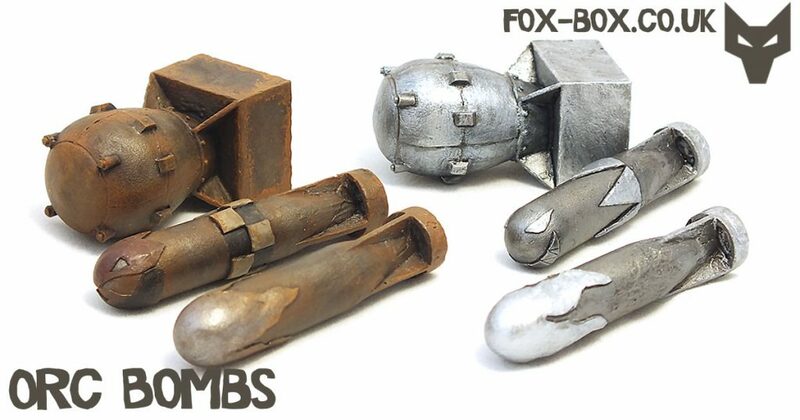 Armour plates, rivets, damage, and of course, objects! Painting also helps but I’m by no means an authority on that. I mostly cover everything in rust and hope for the best! I love how the neon sign turned out and it totally draws the eye. How was it done? It’s literally just a paperclip bent to shape and glued to a little styrene detail. Painting was done with an airbrush for the glow and then the arrow itself was done in a very light pink (with a normal brush). I’ve since inked the whole building so I’ll probably need to redo it but that shouldn’t be too difficult! This style of can is really uncommon over here but it might look completely different to you if they’re commonplace where you are! Next up – the mekshop! The set is two of the big lads and four of the slim jobbies, just like in the photo! Winter is over and spring is here – that means it’s time for CHILLCON*! Well, I mean, it was time for it. It was on Saturday and we saw lots of you there! Some things went well, some went poorly. Thankfully the things that went poorly were relatively minor and the things that went well went really well. We forgot to bring a thermos of tea! Anyway the show was a stonking success and was busier than any we’ve seen so far. 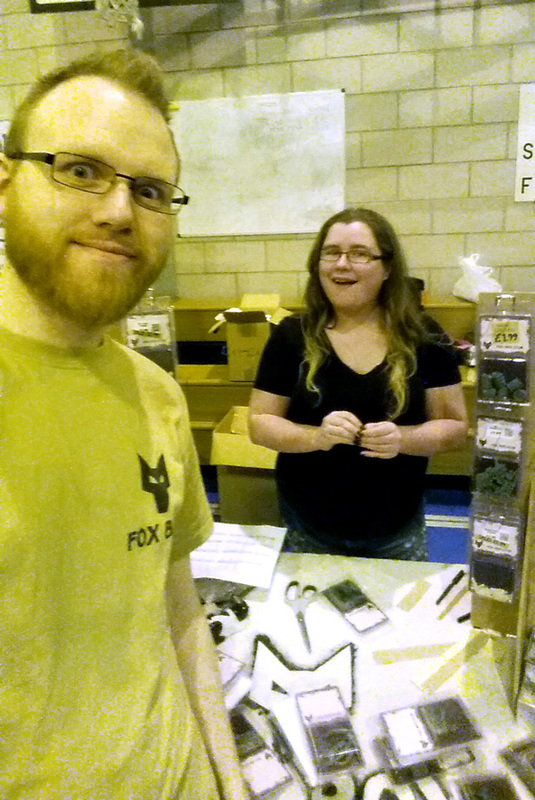 We sold out of plenty of things, new and old, and had some wonderful chats with people. 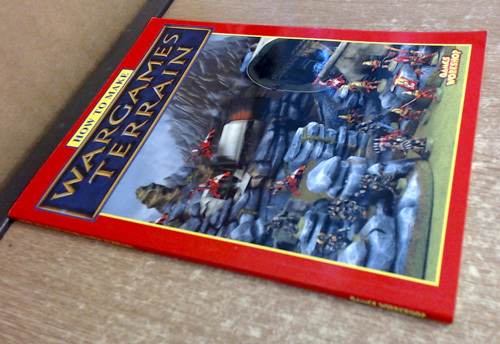 We both love it when people stop by to have a natter – wargaming may be a social hobby during a game but much of the rest of the time we’re in small rooms on our own. We even met some people playing Gorkamorka, something I always want to hear about (my first love!). We were setup between Atlantis Miniatures (take a look at their female dwarves – they’re brilliant) and Victorious Miniatures (not really our thing model-wise but lovely people!). A good spread of stands filled the hall as well as some games too. 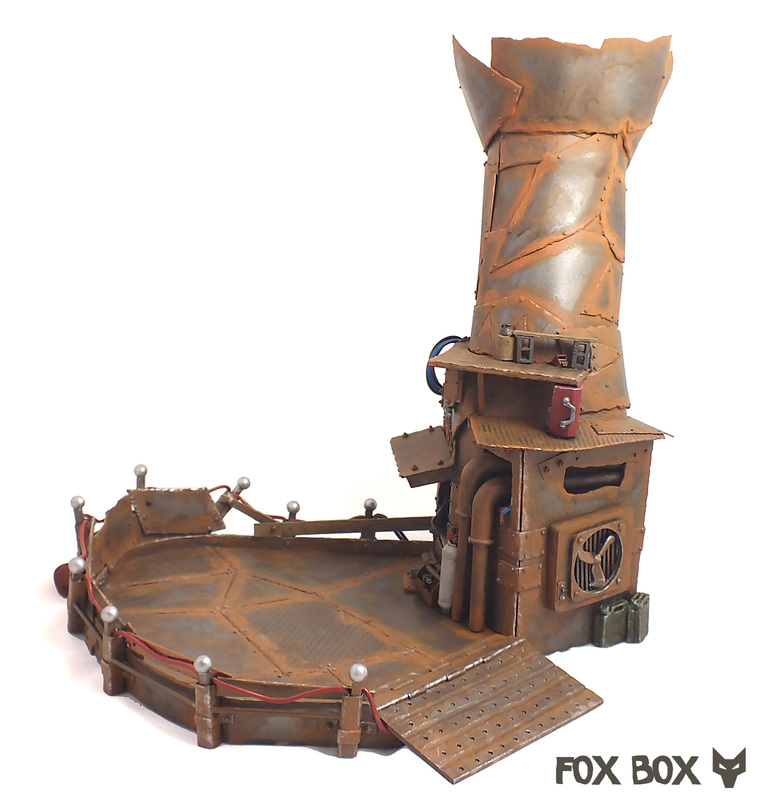 The table using The Unseen University Cut-Out Book as terrain being a particular favourite! 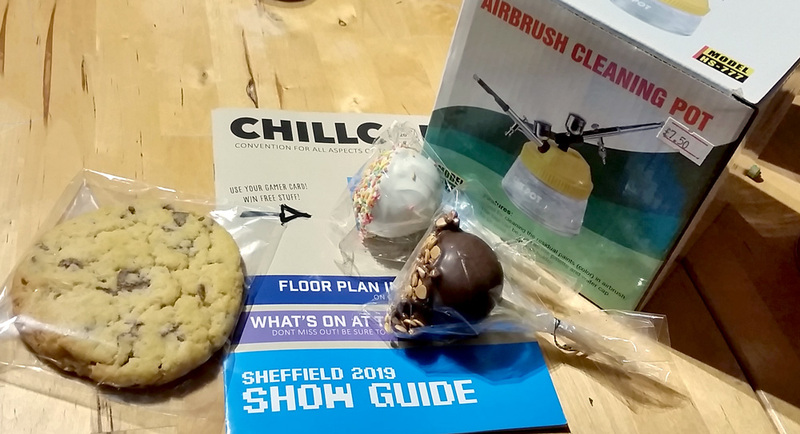 For once we were fairly restrained – some tasty things for eating and an airbrush cleaning pot were our main purchases. I did see some terrain I was tempted by but someone else was much more tempted than me and it was long gone by the time I had a chance at it! 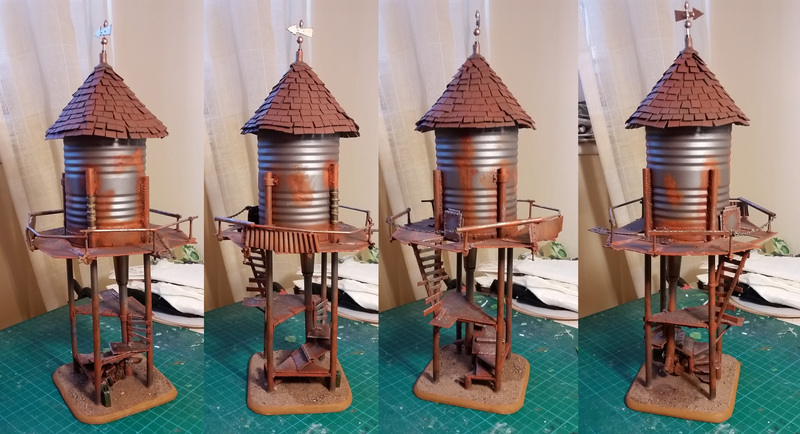 Very pleased with the airbrush cleaning pot – it’s already seen use in my ongoing quest to finish an Ork town I started in 2011. 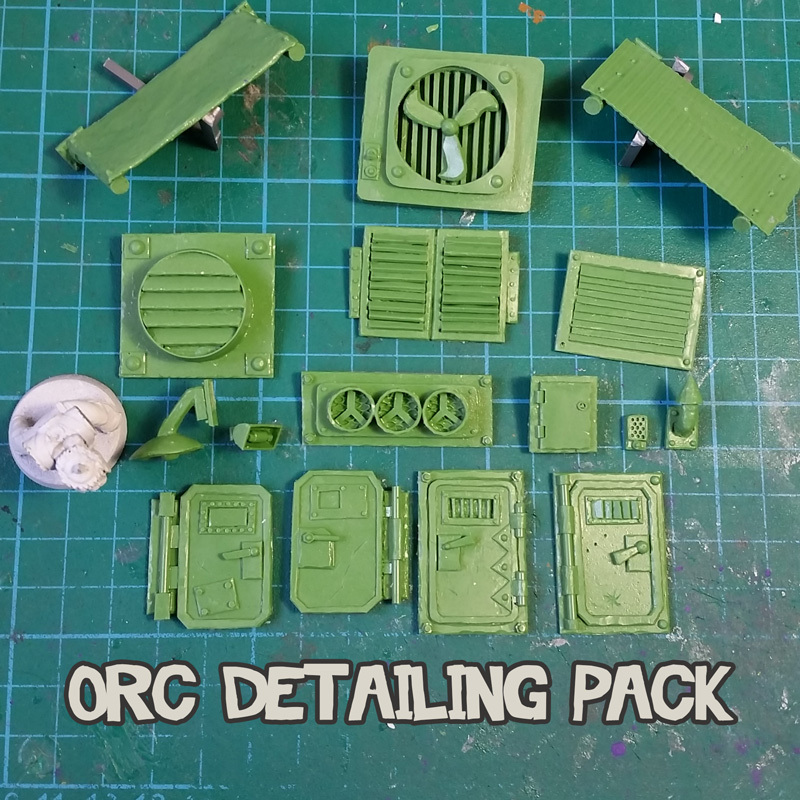 Incidentally that was one of the things we released at the show – the Orc Detailing Pack! 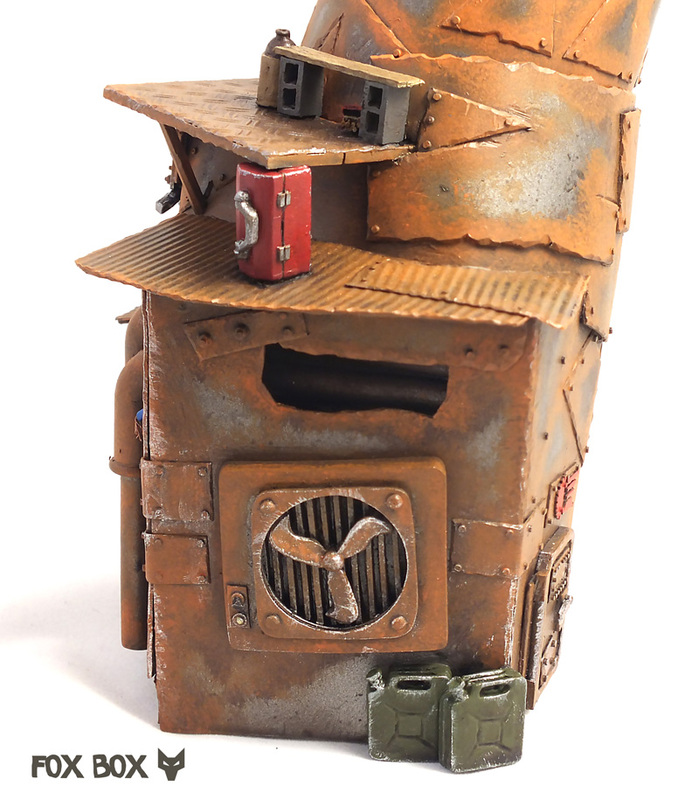 I started it a few years ago for my Ork Battlewagon, Olga, but the intent was always to use them for buildings. 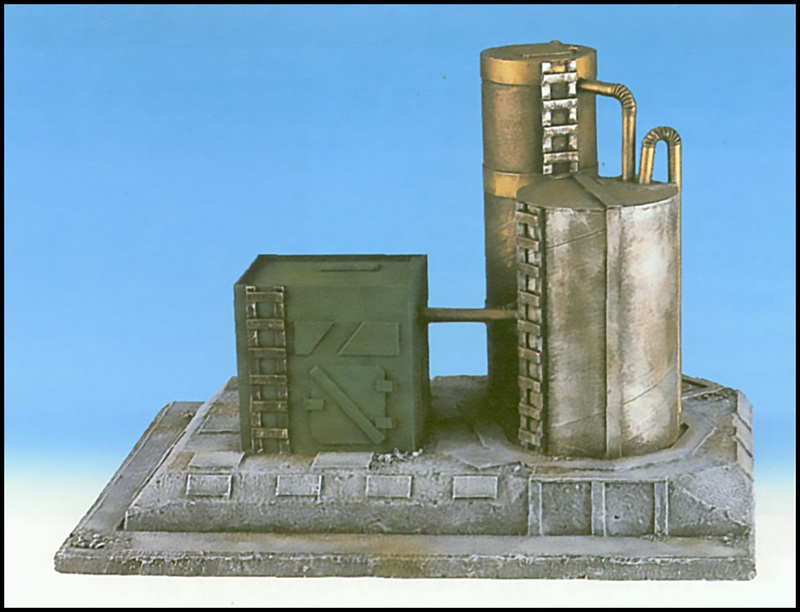 The old version of the mould would not cast the large air conditioning unit consistently (due to all the space behind the fan blades) but that’s now been solved and new stuff has been added. There’ll be a proper product release post about the various things we released in the near future but I wanted to at least write about one of the show debuts! 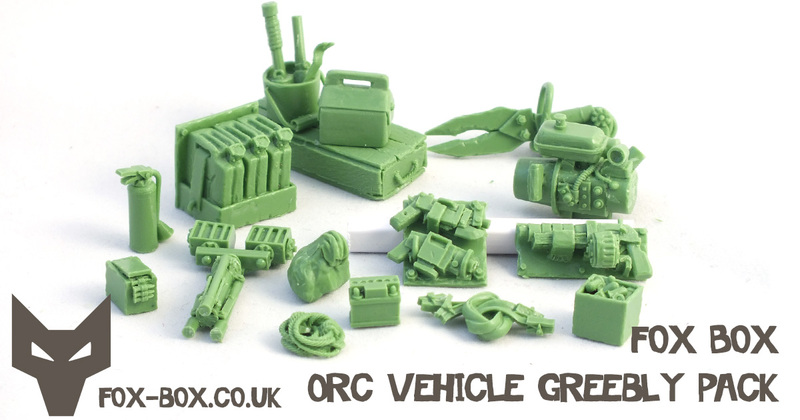 One thing – someone got a free Orc Warlord from us. Our PayPal reader malfunctioned on the first sale of the day (it behaved itself after that – no one else was that lucky!). We played it safe as we’d hate to charge someone twice (and Jenny tells me he was back later to buy some wheels!). Wherever you are you’re welcome to keep him but I want to see him painted! V8! V8! V8! Also a massive shout out to Spud – he’s been having a tough time of late but still found time to paint up our limited edition Orc Freebooter Kaptin. We’ll probably have to do a post on him in a bit as he was amazing to sculpt but a nightmare to cast. That said we sold out of him so that’s still an excellent result! Lastly the cake was particularly delicious this year. Mmm, almondy. Right, roll on CHILLCON Derby! *I believe it’s supposed to be all caps – not sure why but let’s roll with it! Vehicles looking a bit empty? You need some greeblies. 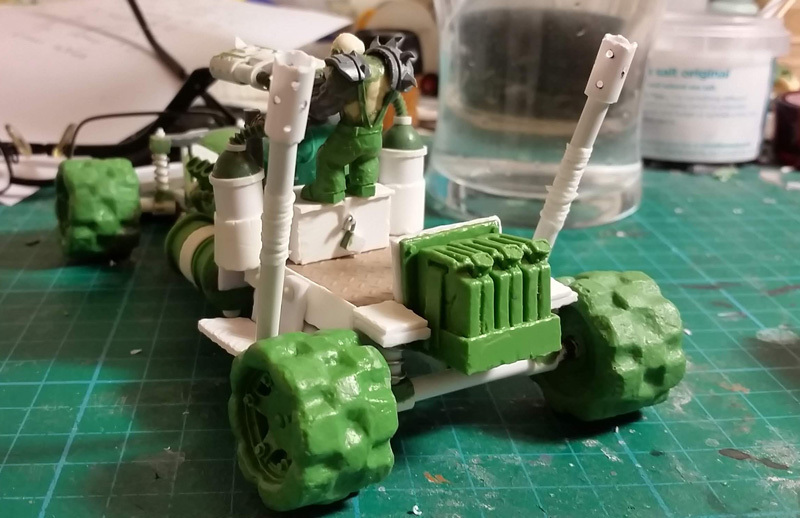 We like creating stuff to make vehicles and terrain interesting and there’s a fair few things in the Kitbasher’z Korner of our shop already. 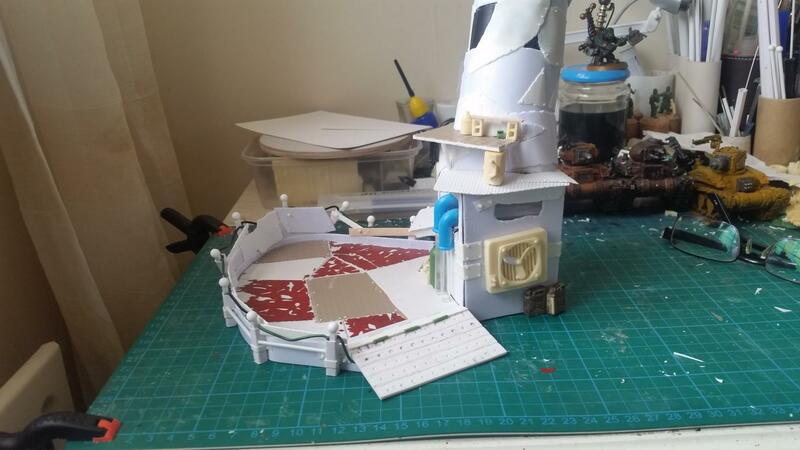 Can there ever really be enough Ork-scale clutter though? 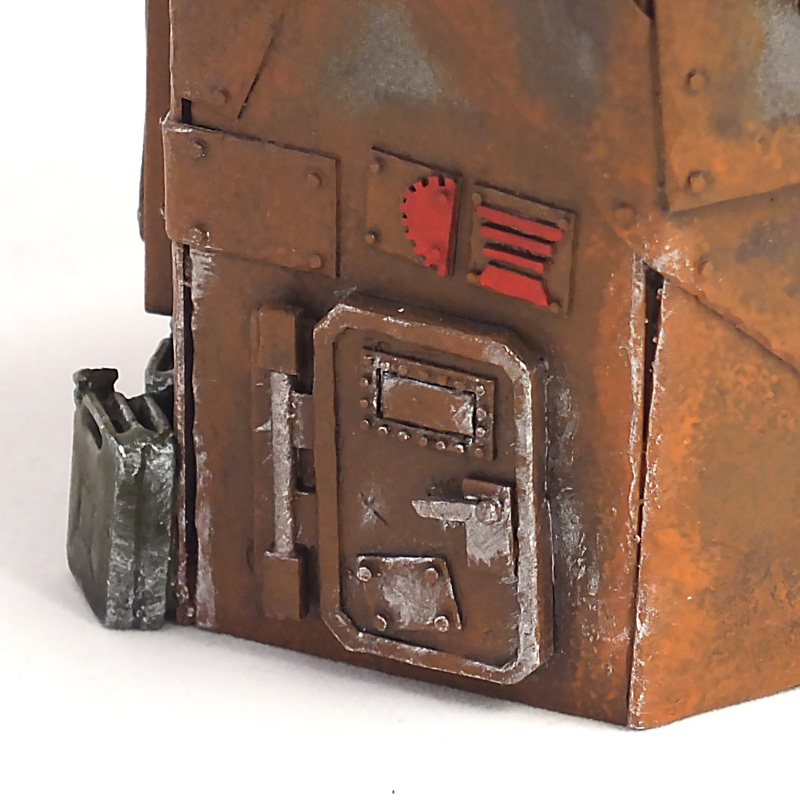 Here’s a load of things that are ideal for livening up the empty bits of a conversion or detailing a bit of terrain. Boxes, crates, equipment – all that good stuff. There’s even some hydraulic snips hiding at the back there. Lovely. 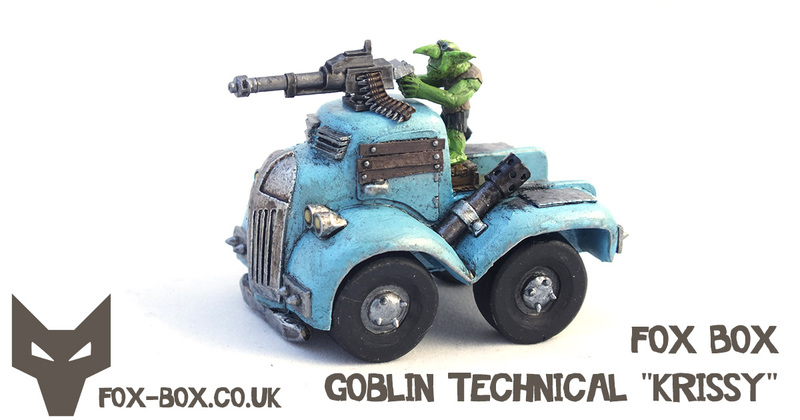 Krissy the goblin truck now available! There’s a lot of new vehicles about this month, aren’t there? Well we didn’t want to miss out on the fun so we’re releasing our own little cab-over-engine inspired model – the Fox Box Goblin Technical. She’s a little under 2″ wide and about 3″ long. Her gun, gunner, and the gunner’s head are all separate pieces too so if you’d prefer her without a crew-served weapon that’s totally an option. It also means that if you’d prefer a different head it’ll be a doddle to swap it! It’s become a bit of a tradition of late to name greenskin vehicles in our house and this latest one is no exception. 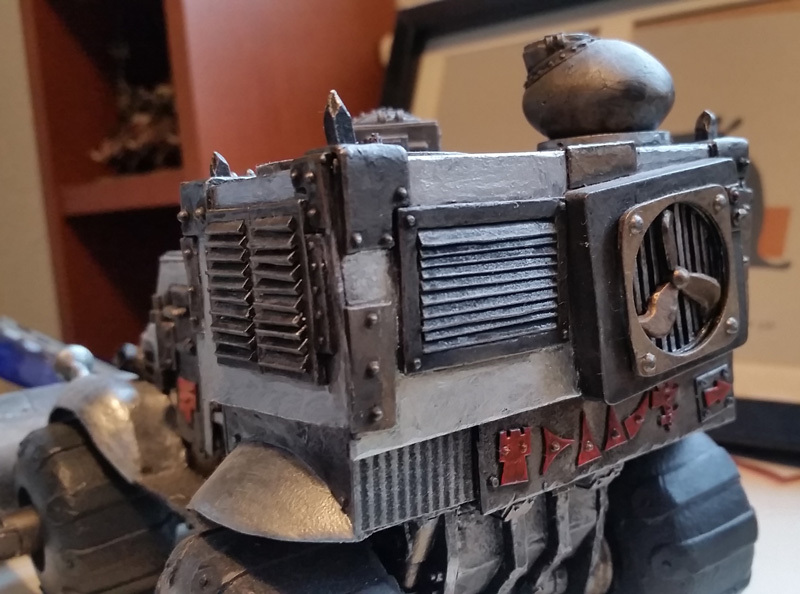 In my army I have a scratch-built Ork battlewagon named Olga, a trukk called Oliv, and Magda the Fighta-Bommer. Those names feel rather substantial though and this petite little thing felt more like a Krissy. Possibly I’ve been watching too much Red Dwarf?